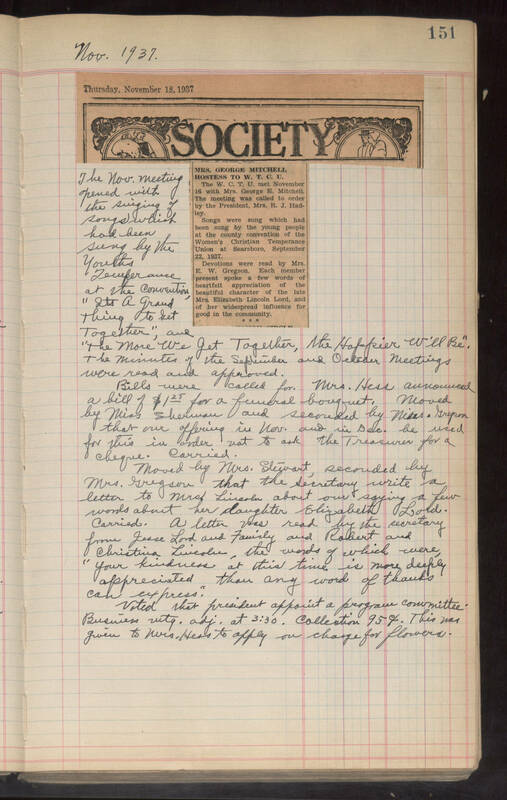 151 Nov. 1937 newspaper clipping goes across top of page, and is centered 3 paragraphs down the page The Nov. meeting opened with the singing of songs which had been sung by the Youths Temperance at the Convention, "Its a Grand Thing to Get Together", and "The More We Get Together, the Happier W'll Be." The minutes of the September and October meetings were read and approved. Bills were called for. Mrs. Hess announced a bill of $1 25 for a funeral bouquet. Moved by Miss Sherman and seconded by Mrs. Gregson that our offering in Nov. and in Dec. be used for this in order not to ask the Treasurer for a cheque. Carried. Moved by Mrs. Stewart, seconded by Mrs. Gregson that the Secretary write a letter to Mrs. Lincoln about our saying a few words about her daughter Elizabeth Lord. Carried. A letter was read by the secretary from Jesse Lord and Family and Robert and Christina Lincoln, the words of which were "Your kindness at this time is more deply appreciated than any words of thanks can express." Voted that president appoint a program committee. Business mtg. adj. at 3:30. Collection 95c. This was given to Mrs. Hess to apply on charge for flowers.